Lily James | Dr. Saint, D.D.S. After its premiere in the UK back in April, The Guernsey Literary and Potato Peel Pie Society received a warm reception throughout Europe, Australia and New Zealand. That’s due to its charming, old-fashioned portrayal of how a tiny English island suffered so much during World War II. The residents are given a new light when a stranger arrives. Four months later, it finally graces the small screens in the U.S., where everyone can enjoy the heartwarming tale in the comfort of their own home after browsing endlessly on Netflix. Director Mike Newell (Four Weddings and a Funeral, Harry Potter and the Goblet of Fire) provides more than a typical history lesson. Based on the best-selling novel of the same name, the movie is set in 1946. It has barely been a year since World War II ended. London is feeling optimistic about the future. For author Juliet Ashton (Lily James), smelling fresh paint on doors suggests a new start. She’s trying to get another big break after writing humorous columns about life during the war. One day, she receives a letter from a farmer named Dawsey Adams (Michiel Huisman, Game of Thrones), a resident of Guernsey, an English island on the Normandy coast. While her publisher Sidney Stark (a deadpan Matthew Goode) suggests her to write about literature, Juliet sets sail to the tiny island after becoming so intrigued by learning about a secret book club developed when Guernsey was occupied by Nazi Germany as a way to avoid curfew (the movie opens up in 1941, where the members are caught by the Nazis, and must come up with an excuse). She receives a warm welcome by the group, and they tell their stories about the island and the disappearance of its founder Elizabeth McKenna (Jessica Brown Findlay, Downton Abbey), in which the residents refuse to speak about. The German-occupation of Guernsey (and Jersey) has rarely been depicted in film. Newell and three screenwriters including Kevin Hood (Becoming Jane) do such a wonderful job providing a fictional yet authentic interpretation of the events that unfold, carefully bouncing back and forth between 1941 and 1946. With Zac Nicholson’s gorgeous cinematography, the Devon coast Guernsey is used as the backdrop for Guernsey, which he tries to avoid it looking like a travelogue. While it might drag every now and then, The Guernsey Literary and Potato Peel Pie Society (“Crikey, that’s quite a mouthful,” says Sidney) tells a fascinating story about something I knew very little of. Book fanatics and history buffs will most certainly get something out of it. This romance contains enough mystery to carry through. The best Netflix original film of the summer! Starring in about a hundred films, Gary Oldman is one of the greatest character actors working today. Ranging from Sid Vicious (Sid and Nancy), Lee Harvey Oswald (JFK), Commissioner Gordon (The Dark Knight films), Sirius Black (Harry Potter), Dracula, Stansfield (Leon: The Professional), and Zorg (The Fifth Element), he has one impressive repertoire. Now–he takes part in delivering the most ambitious role of his entire career. Hundreds of actors have played U.K. Prime Minister Winston Churchill; from Timothy Spall in The King’s Speech to John Lithgow–a surprising turn–in Netflix’s The Crown. After spending 200 hours in the makeup chair, Oldman is unrecognizable as Churchill in Joe Wright’s new film Darkest Hour. With a screenplay written by Anthony McCarten, it might be a romanticized portrait of Churchill’s first days as Prime Minister, but there is a lot to like here. In May of 1940, World War II is in full steam. Nazi Germany has just invaded Czechoslovakia, Denmark, Norway, Belgium, and the Netherlands. Churchill (Oldman) steps in to replace Neville Chamberlain (Ronald Pickup, who took John Hurt’s place after his death) as Prime Minister, accepted by King George VI (Ben Mendelsohn). Right away, he must find a solution to a peace agreement with Germany. With the support of his secretary Elizabeth Layton (Lily James) and wife Clementine (Kristin Scott Thomas), he does whatever he can to save British troops on the beaches of Dunkirk. Darkest Hour makes a great triple feature with this year’s Their Finest and Dunkirk. Through the long, unbroken shots, the dramatic close-ups, and the gorgeous, vintage sets, this is pure Joe Wright. Oldman delivers his performance with enough wit and empathy that the audience forgets they are watching an actor. We laugh when we’re supposed to (“Will you stop interrupting me while I’m interrupting you! ?” he sneers at his War Cabinet. ), and we root for him every step of the way when he attempts to save the world. While James and Mendelsohn are worth mentioning of their wonderful performances, Darkest Hour is Oldman’s show through and through. How can you not have the feeling of standing up and cheering after he delivers his famous “We shall fight on the beaches” speech in Parliament? I would be shocked if he doesn’t get nominated for an Oscar. He is long overdue for one! Based on Seth Grahame-Smith’s novel of the same name, this mashup of the undead coming into Jane Austen’s classic story of the high social class in 19th century England might sound trashy. Smith’s previous adaptation was 2012’s Abraham Lincoln: Vampire Hunter. The satirical tale took its premise way too seriously. With countless adaptations of Pride and Prejudice, this is the first one to contain zombies. Director Burr Steers balances the humor and the thrills well. The zombies are as comical as they are disgusting. Not to mention one scene involving a church communion where the zombies drink pig’s blood with pig’s brains (even that could get away with a PG-13 rating). There isn’t as much zombie action as one would expect, but there is plenty to keep the film going. The gore is mostly off-screen, except for some brief shots of the zombies getting their brains blown off. Yet again, it’s Pride and Prejudice. It’s not without its romantic charms. Known for her performances on Downton Abbey and last year’s live-action version of Cinderella, Lily James proves to be more than just a pretty face. In her portrayal of Elizabeth Bennett, she doesn’t necessarily need a husband–or Mr. Darcy (Sam Riley) in this case. She takes care of herself fighting off the zombies. When he sets eyes on Liz, Darcy is impressed by her knowledge of the martial arts. They have each other’s back. The downside is that Darcy can be a bit aggressive. They even get physical at one point. The rest of the cast–including Bella Heathcote, Charles Dance, and Lena Headey–is solid, but Matt Smith steals the show as the socially awkward Mr. Collins, whose comedic timing and expressions are nothing short of perfect. With the beautiful sets, scenery and costumes, it is undeniably flawed. As enjoyable the action is, some of the editing can get a little choppy. Pride and Prejudice and Zombies can get out-of-hand by the last act. It doesn’t end, it more than just stops. Nevertheless, it offers enough for fans of Jane Austen and zombie fans. This is one inventive, hilarious, and entertaining mash-up. Since 2010, with the release of Tim Burton’s Alice in Wonderland, Disney is remaking their classic films for the new generation. But, they don’t quite live up to their original source material. Last year’s Maleficent was a prime example losing of its focus. Even though it wasn’t bad, not to mention Angelina Jolie’s devilishly evil performance as the title role, it didn’t live up to the hype. 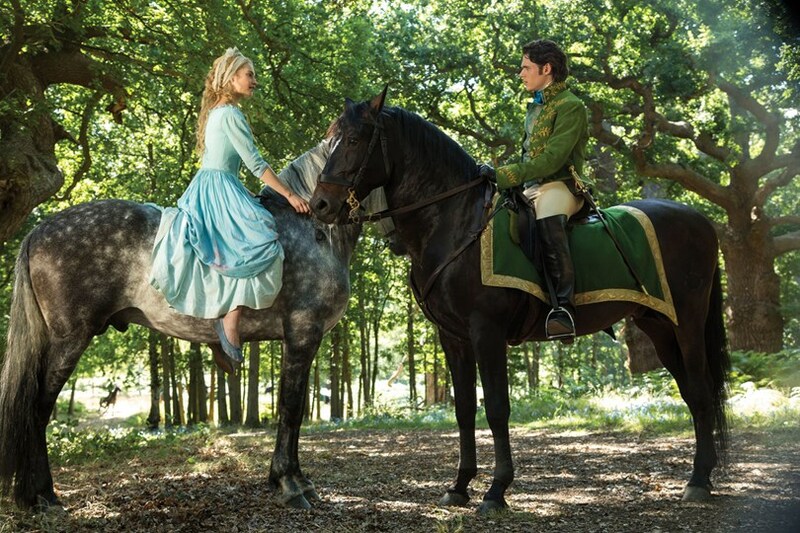 Now in 2015, we get a new live-action rendition of the 1950 Disney classic Cinderella. What a delightful surprise! Director Kenneth Branagh (Thor) and screenwriter Chris Weitz capture the fairy tale with a few twists while keeping it old-fashioned and beautiful without overstuffing with CGI effects. Because I hardly remember the Disney version (I might have seen it when I was really little), doesn’t mean I’m not familiar with the story. Following the death of her parents (Hayley Atwell and Ben Chaplin), Ella (Lily James, Downton Abbey) is forced to live with her evil stepmother Lady Tremaine (Cate Blanchett) and her stepsisters Drisella (Sophie McShera) and Anastasia (Holliday Grainger). She endures the abuse from them (not to mention giving the name Cinderella) and she spends most of her time doing her chores around the house. She starts to lose hope until Kit, a prince (Richard Madden, Game of Thrones), announces to the public that he is holding a ball at his palace so he can have an ideal mate. This gives Cinderella the opportunity to meet the love of her dreams and fall in love. She loses her glass slipper at the palace, and…you know what happens next. I didn’t expect Cinderella to be something spectacular. It’s not like Snow White and the Huntsman or Maleficent where it’s a much darker take on the source material. This is a much more faithful take on a whimsically beloved fairy tale. The cinematography is simply gorgeous, and the sets and costumes are ravishing. With a gifted cast including Cate Blanchett and Helena Bonham Carter (genuinely amusing as the Fairy Godmother), I cannot picture a better actress to play Cinderella other than Lily James. Not only is she drop-dead gorgeous, she also gives a lot of heart from the very beginning. A lot of people have been wondering if her waist was computer-generated while wearing the dress. Because the skirt is so big, her waist is actually that small. Lily James had to have a diet in order to fit in that dress. Gosh, does it look so good on her!? Featuring a wonderful score by Patrick Doyle, Cinderella perfectly blends wit and emotion with the theme, as said by Cinderella’s mother early in the film, “Have courage and be kind.” This is the first great movie of 2015.